Members of the cast of the Arts Club Theatre Company production of Peter and the Starcatcher. Photo by Emily Cooper. Several times during Peter and the Starcatcher, the would-be Peter Pan declares just how much he doesn’t trust adults. 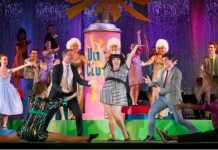 No need to worry here though, for in the hands of the grown-up cast of the Arts Club production currently on stage at the brand new BMO Theatre Centre, they are so child-like in their play that it is hard not to be swept away. 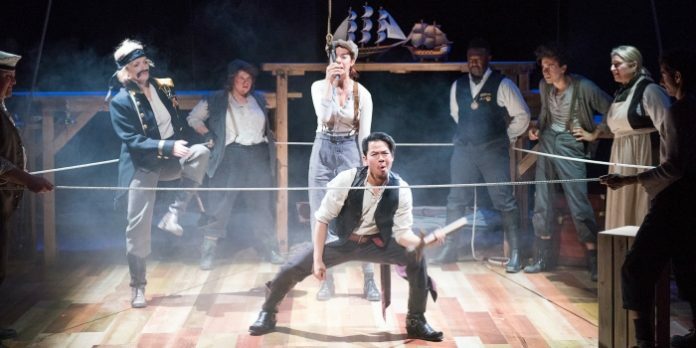 The action in Peter and the Starcatcher is as non-stop as it is creative, performed by a cast that fearlessly taps into their inner child. The result is a grand adventure for those that have yet to grow up, and for those of us that refuse. Based on the book by Dave Barry and Ridley Pearson, Peter and the Starcatcher is the origin story of Peter Pan. It follows the adventure of a young orphaned boy who takes to the high seas stowed away on the Neverland, a ship bound for the kingdom of Rundoon. While aboard, the would-be Pan (Benjamin Wardle) befriends the young Molly Aster (Rachel Cairns), who we discover is an apprentice Starcatcher. Appointed by the Queen to collect the “starstuff” as it falls to earth, Starcatchers dispose of the magical element in the world’s hottest active volcano, which just happens to be in Rundoon. Out to get their hands on the starstuff before it is destroyed is a band of pirates led by the Black Stache, played with delightful over-the-top villainy by Colleen Wheeler. It is up to Molly and her new found friend Peter, and a couple of other orphan boys (Katey Hoffman & Chirag Naik), to help keep the starstuff from falling into their hands. Along the way, they encounter and battle all manner of strange creature. If it all sounds a bit manic, it is. But it is also very, very clever as playwright Rick Elice gives us a frenetic two hours that keeps both the young’uns and adults enthralled by its ridiculousness, and in the inventive way in which it tells its story. There are also many nods to J.M. Barrie’s original to help keep things somewhat familiar, including the reason Black Stache loses a hand to eventually become Captain Hook, or in discovering who the young Molly grows up to be. Creating all of this mayhem inside the BMO Theatre Centre black box is no easy feat, but director David Mackay leaves much of it to our imaginations, and that of his playful ensemble. Need to show the Neverland being pursued by another sailing vessel? Model ships do the trick. Want to show the crocodile grow to massive proportions before our very eyes? A collection of white marine signal flags are unfurled. Want to show a mermaid inside a shimmering pool? How about a whimsical mermaid tail manipulated by one actor, as another creates movement in the metallic cloth thrown onto the stage? Sure many of the jokes are sophomoric and the tribe of mollusks are reduced to a silly stereotype, but what’s a few fart jokes or characters speaking in Italian gibberish, when you get to see the antics of Colleen Wheeler and Emmelia Gordon as the Black Stache and his her trusty side-kick Smee? Or witness the burgeoning and hilarious romance between Mrs Bumbrake and Alf, played with comedic skill by Beatrice Zeilinger and Chris Cochrane? Or the imaginative trek Molly takes through the bowels of the Neverland, or the very funny act two opener of singing mermaids? The examples are seemingly endless. Costume designer Carmen Alatorre gets to get a little wild too, and set designer Lauchlin Johnston builds a wonderful fort for them all to play in. Peter and the Starcatcher by Rick Elice. Based on the novel by Dave Barry and Ridley Pearson. Music by Wayne Barker. Directed by David Mackay. An Arts Club Theatre Company production on stage at the BMO Theatre Centre (162 W 1st Ave, Vancouver) until January 10. Visit http://artsclub.com for tickets and information.